I've painted in four countries this year through wind, rain, snow, fog, drizzle and even sunshine - on occasion! 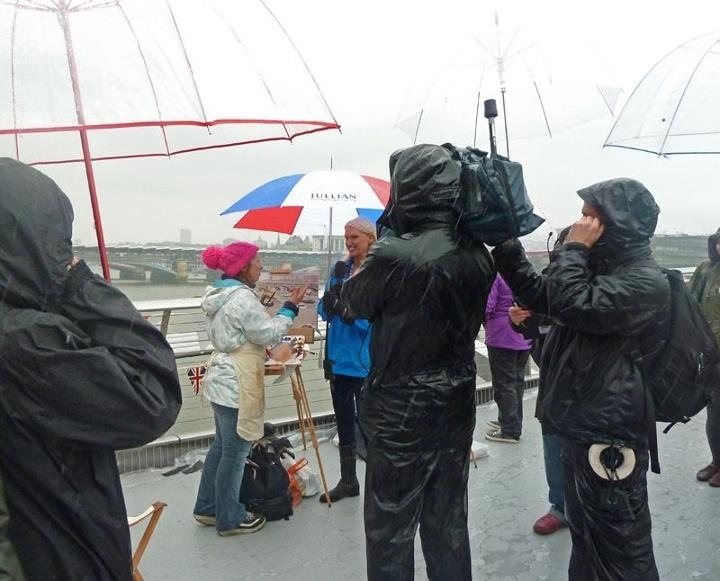 - while being filmed for the BBC coverage! Carol Lee Beckx (Art Matters) felt the same way as me and nominated Haidee-Jo for this award. Her paintings are fresh, vibrant and of a very high standard. The plus factor on Haidee's blog Haidee-Jo Summers artist - ma vie en couleurs is personality plus sharing what and how she paints when working plein air. What I really like about Haidee's blog is that it's just like meeting her - sunny, chatty and confident. You learn without realising that she's handing out useful snippets and tips. It makes you think you can take up your brushes and go outside and paint just like her - with exuberant colour in her extremely competent alla prima mode. You can see a review of Haidee-Jo's year in a review on her blog - why not have a read and see what I mean! 2012 review - January to March! 2012 review - April to June! 2012 review - July to September! 2012 review - October to December! While many people carry a sketchbook, not everybody travels with one. One of the characteristics of the people who have won this prize to date is that they have all travelled to other countries and made sketches of what they've seen on their travels. This year I'm going to award this prize to somebody who routinely carries his sketchbook with him and sketches while travelling to work and his studio in Chelsea on the other side of..... London. So no overseas trips - but lots of sketching! Check out this post for an example of what gets posted - Sketches on the Bus, Train and Tube in October I. For those who have never tried drawing on public transport before, I have to tell you that form of sketching is a challenge! Bear in mind the transport does not provide for a smooth journey and you never ever know when your subject is going to get up and leave! Adebanji Alade (Adebanji Alade: My art, my passion for sketching) is something of a role model for all those who want to get better at drawing and painting people. He keeps his expenses on hiring models to a minimum. Ever since I've known him - which is now quite some time - he's drawn the people he sees while travelling on public transport in London. In doing so he has built up his skill level at the same time as developing a portfolio of sketches to use as a basis for his paintings. His blog is full of sketches done on journeys across London. The bonus is that he then also shows on the blog how he works when translating sketches typically drawn monochromatically in pencil or charcoal into portraits painted in oil. This award includes all those who blog about animals, birds, flowers and plants. Blogs are not required in any way to limit themselves to just those topics but they do need to have a feel for being green and sustainable about them. They also get extra points for getting out and about and drawing from life! This year I'm awarding this prize to a blog which is written as a resource rather than by an artist. ArtPlantae is a resource provider whose aim is to encourage an interest in plants, to make botany a more palatable subject, and to accomplish both through the use of drawing as a learning tool. Tania Maren's ArtPlantae Today is essential reading for all those interested in botanical art and drawing. Regular posts are frequent and always 'on topic' and full of high quality information about all the sorts of things that botanical artists are interested in. They include interviews with established botanical artists of some renown and news about workshops, exhibitions and new books. I've been reading it for years and have the highest regard for its content and author. I seem to have missed a post! 'Course, I am having some computer issues but they will soon be fixed for awhile. New computer on the way. I love these blog posts of yours. They are always so informative and so eye-opening to see what is out there. Often artists that I've not seen before. You put an amazing amount of work into this blog and it shows! Congratulations to your winners. I knew Haidee-Jo's work already but not Adebanji. Exciting work. Thank you so much Katherine, and Carol, I am absolutely over the moon to win this award! I only discovered the online world of art blogging in September 2011, and can hardly believe I could win an award like this for my blog only fifteen months after starting it! It has been an incredible year for sure, and I look forward to many more plein air painting adventures in 2013! Thanks for this great AWARD! It's another one for my Trophy Cabinet! Congrats to Haidee too for another Award, she's bagged so many this year! When artists are recognized and rewarded like this, it makes it worth all the while... It is the best and most fulfilling payment an artist can hope to get for his/her talent, dedication, fortitude, resillience and perseverance. My BIG CONGRATS to all the winners, especially Adebanji Alade, who I know personally. Your best is still on the way ! I just now learned of this news. Thank you for awarding ArtPlantae with the "Going Greener Gong" and for bringing attention to the site and the wonderful guests who have taught us so much. Tania - I sent emails out to everybody back at the beginning of January - maybe your email went to the wrong address or got buried?